Flexible training dates and locations, high and low difficulty air routes and crew focused on your progress. That’s how it is in our Approved Training Organization (ATO). Helipoland is the simplest and in our opinion the best way to become a helicopter pilot and easily perform exceptional flights. We conduct training courses for the LAPL(H), PPL(H), CPL(H) licenses and for many different ratings entered into the pilot’s license, including type ratings for various types of helicopters. Regardless of whether you will be a helicopter holidays traveller or every day pilot, you need a careful preparation. Our staff, who have been involved in pilot training for years, will give you all their knowledge about helicopters and their control. Thanks to it you will learn to fly confidently, stably and responsibly. 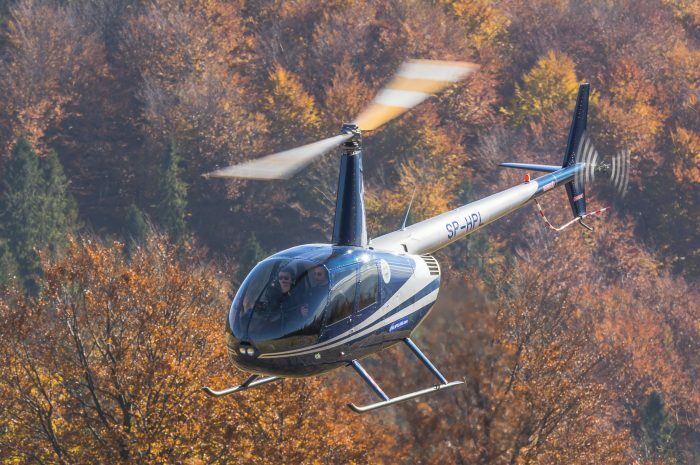 We usually provide flight training on Robinson R 44, which is the most popular helicopter in the world, especially in civil aviation. It is particularly appreciated for the relatively easy and economical exploitation in its class, decent performance, good visibility from the cabin and for that it is controlled gently and lightly, which provides an amazing experience in the air. 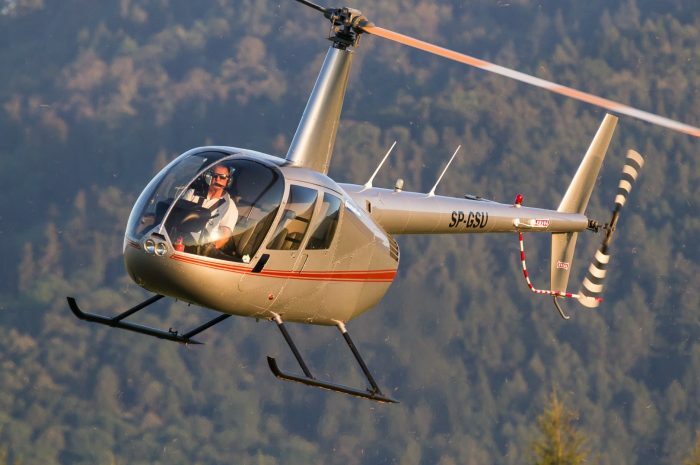 You will learn about many other advantages of this versatile machine during classes in Helipoland. Robinson R 66, Bell 206 and 407, Eurocopter EC120, EC130 / AS 350 as well as multi-engine helicopters, e.g. AW109SP, Eurocopter EC135 or AS355. If you are considering getting a pilot license, but you are not sure if the sky adventure is for you, take familiarization flights. Do you think about flying? Do you want to control the helicopter yourself? With the LAPL(H) license, you can develop your passion in various ways. First of all, you can use the helicopter to quickly move around Europe. What does the LAPL (H) license permit? LAPL(H) training is the shortest way to fly a helicopter by yourself. The license entitles you to pilot helicopters not exceeding 2 tons with a maximum of 3 passengers on board. Flights can take place all over Europe, but you can go beyond Polish borders after passing the English language exam (ICAO level 4). With the ability to extend your rights, getting this license can be the beginning of your professional career pilot. The LAPL(H) course in Helipoland is designed to guide you from the moment you start studying to obtaining a license in the most effective way. And although you can choose the place where you want to train, we strongly encourage you to take them at our base airports in Kaniów and Bielsko-Biała. We know from experience that the proximity of mountains, large cities and foreign airports is the best solution for professional mastering of the art of flying. There is another advantage: flying a helicopter in such terrain provides amazing views and experiences. Theoretical training – the same for the LAPL(H) and PPL(H) licenses, lasts 100 hours (at least 10 hours of lectures, and 90 hours may be self-study from materials specially developed by us). During the training you will gain knowledge, among others in the field of aviation law, meteorology, navigation, flight rules and communications. Practical training – a minimum of 40 flight hours (including a minimum of 30 hours of flight with an instructor and minimum 10 hours of solo flight, under supervision). After completing it, along with passing the theoretical exams, you take the practical exam with the examiner of the Civil Aviation Office (usually less than 2 hours of flight). 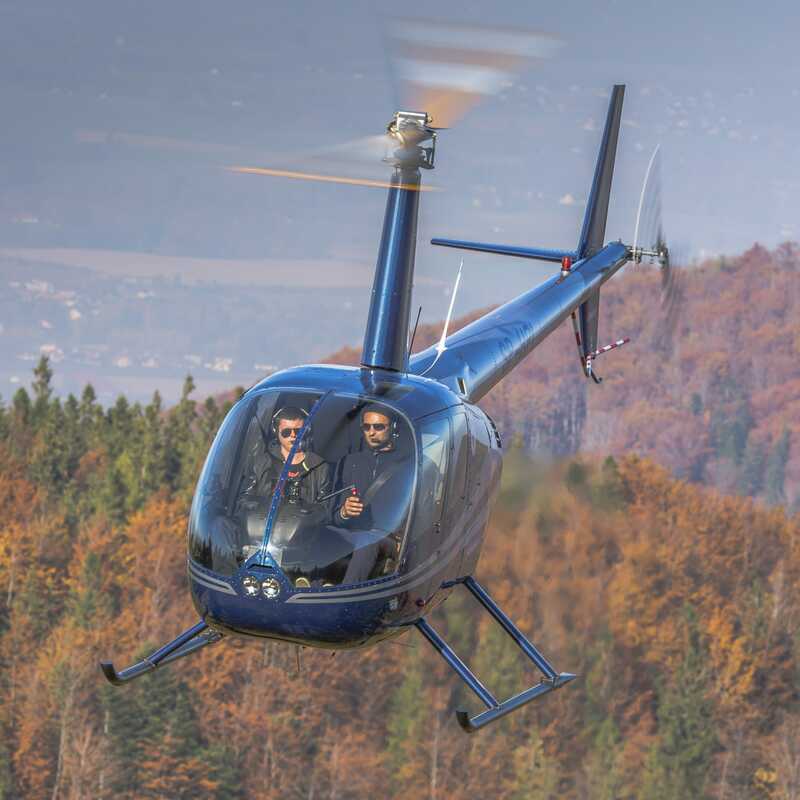 Do you want to fly a private helicopter almost unlimitedly? Regardless of whether you are doing it because of a hobby or in the future you want to make money by flying: get a PPL(H) license. 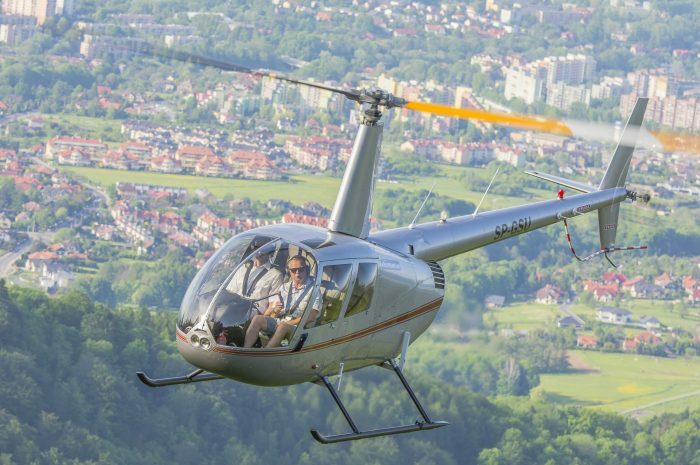 You will be able to fly a recreational helicopter in all countries of the world and start training for a professional license. What does the PPL(H) license allow for? Obtaining a PPL(H) license is the basis from which almost every professional pilot trained in civil aviation began. The license entitles you to pilot a helicopter, the type of which you choose during the training. If you pass the English exam (ICAO level 4), you can take private flights in each country in the world. With the PPL(H) license, you can become a helicopter instructor and gain experience faster so that you can pilot more advanced machines in the future. 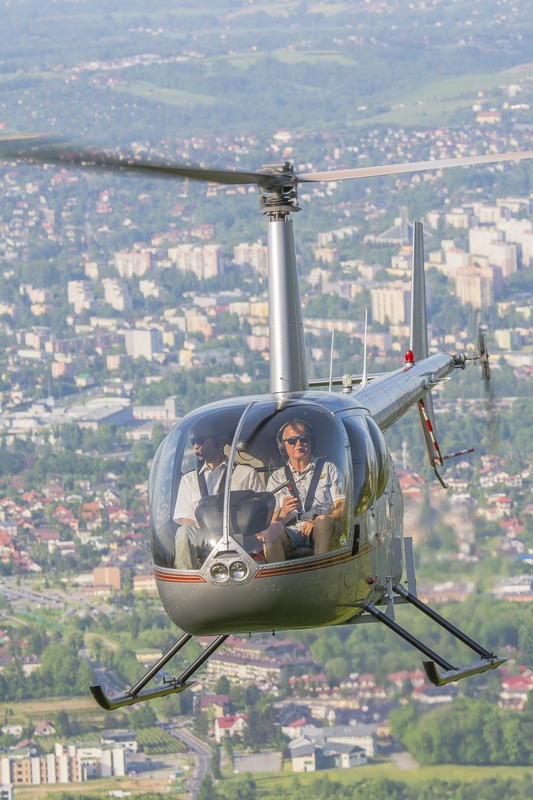 The PPL(H) license course in Helipoland has been designed to guide you from the moment you start studying to obtaining a license in the most effective way. And although you can choose the place where you want to train, we strongly encourage you to take them at our base airports in EPKW and EPBA. We know from experience that the proximity of mountains, large cities and foreign airports is the best solution for professional mastering the art of flying. There is another advantage: flying a helicopter in such terrain provides amazing views and experiences. Theoretical training – the same for PPL(H) and LAPL(H) licenses, lasts 100 hours (at least 10 hours of lectures, and 90 hours may be self-study from materials specially developed by us). During the training you will gain knowledge, among others in the field of aviation law, meteorology, navigation, flight rules and communications. Practical training – minimum 45 hours of flights (including a minimum of 35 hours of flight with an instructor and minimum 10 hours of independent flight, under supervision). After completing it, along with passing the theoretical exams, you take the practical exam with the examiner of the Civil Aviation Office (usually less than 2 hours of flight). Do you think about a professional pilot career? If you want to learn how to control a helicopter and make money on flying, get a CPL(H) license and you will have great opportunities. First of all, you’ll be able to start an exciting job: above the clouds, at the controls of the helicopter. What does the CPL(H) license allow for? Training for a CPL(H) license will definitely be a breakthrough in your pilot career. This license entitles you to perform commercial flights on a helicopter in which the flight exam took place. You will be able to earn money by flying, and also by doing short TR training for a given type of helicopter, also make flights with other helicopters. You will be able to fly on the territory of all European countries associated in the European Aviation Safety Agency. You can also extend your rights at any time by undergoing training, thanks to which your license will be recognized in other countries of the world. Our main base in Kaniów (EPKW) and Bielsko-Biała (EPBA) is the perfect place to take a professional pilot course. The airport in Kaniów is well equipped to perform not only daytime but also night flights, which are especially important during vocational training. In addition, the proximity of mountains, as well as state and foreign controlled airports makes learning intuitive control of maneuvers and maintaining stability in the air is more effective. Theoretical training – it lasts for 350 hours (at least 65 hours of lectures, and self-learning with materials specially developed by us). Practical training – it lasts 135 hours (including 50 hours of independent flight, under supervision). Theoretical training – lasts for 250 hours (at least 50 hours of lectures, and the remaining hours can be self-learning with specially developed materials). Practical training – it lasts 30 hours (or 35 hours if the candidate does not have the authority to perform night flights). After completing both stages of the training, along with passing the theoretical examinations in English, a practical exam is taken with the examiner of the Civil Aviation Office. Who can obtain a CPL(H) license? To obtain a professional CPL(H) helicopter license in an integrated mode, no aviation experience or any other entitlement is required. If you already have a PPL(H) pilot license and 155 hours of experience in piloting helicopters, your CPL(H) course will take place modularly (in short mode). 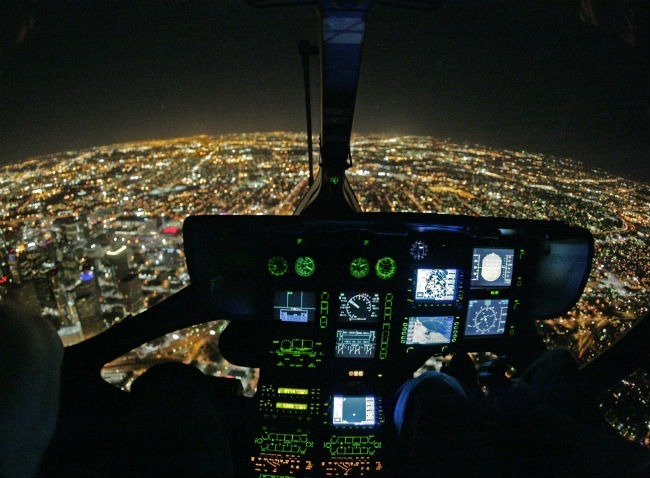 Are you thinking about training, but you have never been flying a helicopter? 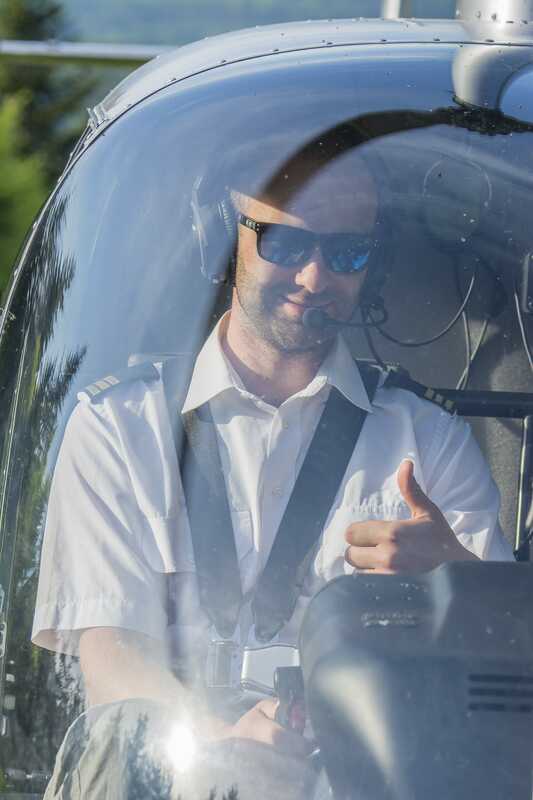 If you do not know whether you are able to absorb the necessary knowledge during the pilot course, come to familiarize yourself with a helicopter in Helipoland. Why is it worth taking advantage of familiarization flights? 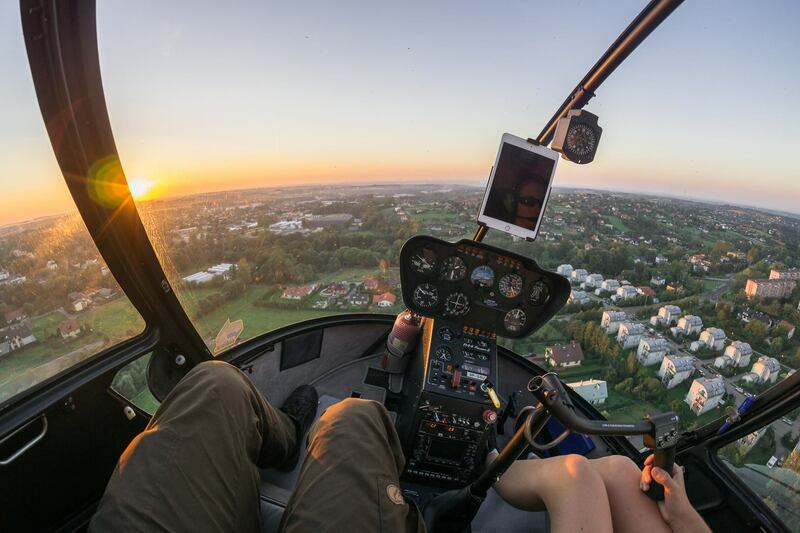 During the familiarization flight you will learn the basic principles of helicopter piloting. You will be able to check your predispositions to being a pilot while sitting at the controls of a helicopter or as a passenger. 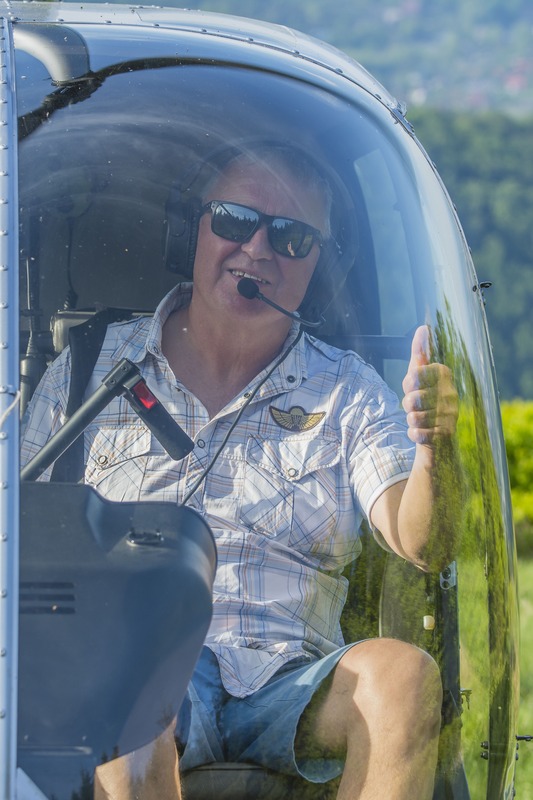 A reconnaissance flight with instructor assistance will help unravel your doubts as to whether to start a course for a tourist or professional pilot license. 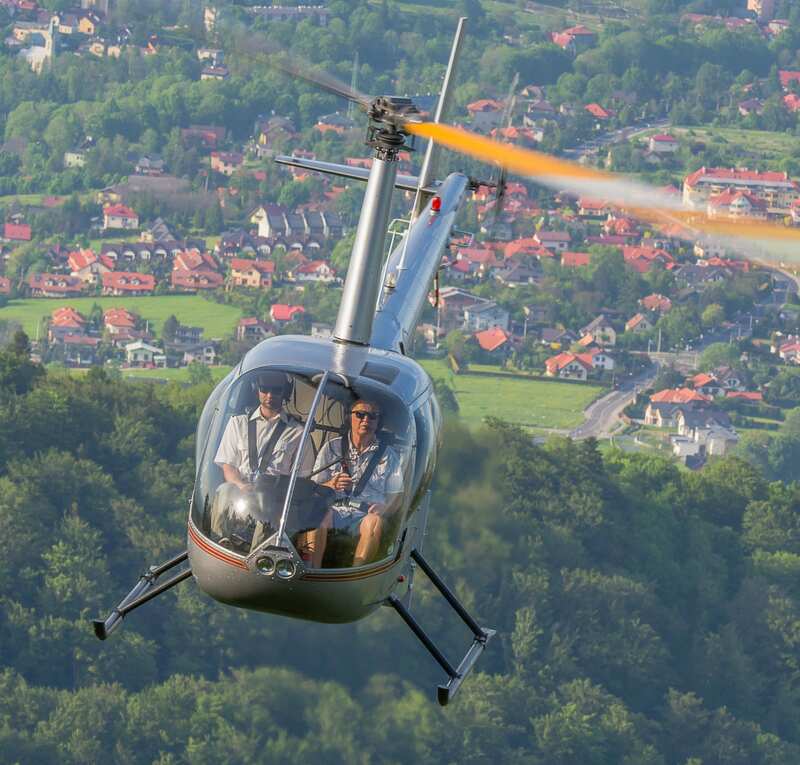 You can take two people on your familiarization flight in the Robinson R 44 helicopter, who together with you can admire the surroundings from a bird’s eye view and observe your first aerial struggle with the laws of physics in an open air. 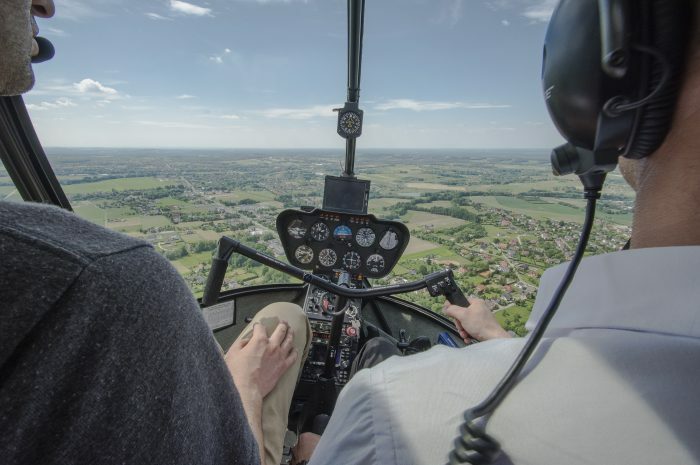 Learning to fly by helicopter is a magical experience and Helipoland can help you fulfill your dream of flying. We conduct familiarization flights and teach you how to fly helicopters of various types anywhere in the country, 7 days a week, both day and night.